January 28, 2019 | 2018 will go down as the year in which some of the largest traditional media companies started to show their cards vis-a-vis their over-the-top (OTT) distribution strategies. With three large-scale mergers (AT&T-TWX, Disney-Fox, and Comcast-Sky) either complete or nearing completion, we expect the market to increasingly focus on the differences in strategic approach and key subscriber metrics of each new OTT product. 2018 will also be the year in which some media companies (Disney) decided to embrace a closed-end media system in which they produce and distribute content that is exclusively available on their own closed networks. Disney has been very public about its intention to launch the recently named Disney+ at the end of 2019. Its pending acquisition of Fox will create unrivaled scale in global TV and film production, increased ownership of Hulu, the leading linear and online media presence in India – all the assets needed to build global closed-end systems. 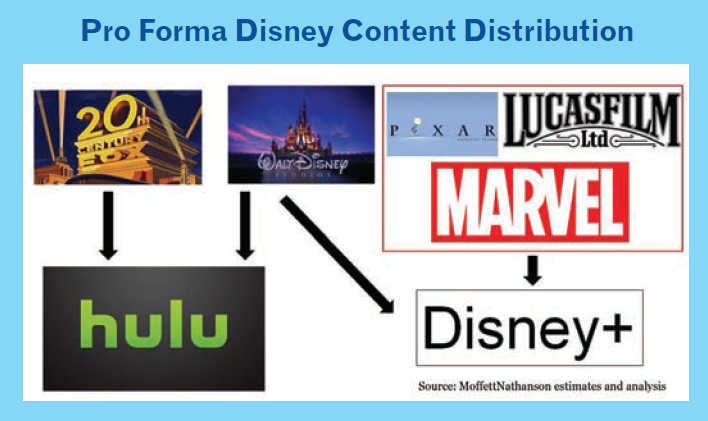 In the long run, after passing through some initial early windows like broadcast or theatrical release, Disney’s and Fox’s TV and film production will likely be exclusively found domestically on the Disney+ and Hulu services (see Exhibit 1). In November, AT&T shared a different DTC strategy. 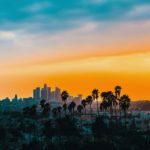 At its investor day, AT&T announced a three-tiered DTC product, launching in 4Q 2019, featuring an entry tier of non-blockbuster movies, a premium tier of premium and popular TV shows and blockbuster movies, and a bundled service that includes the first two tiers and additional content genres. 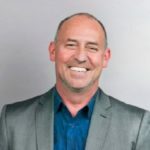 In the follow-up Q&A session, the company said that it would continue to license content to third parties both in the U.S. and internationally. AT&T also announced that it had licensed Friends to Netflix on a non-exclusive basis, which means that the show can go on the AT&T platform as well. In essence, AT&T is proposing a very different structure than Disney and, at the moment, unwilling to trade off the long-term value of building a globally scaled DTC platform for the continuation of short-term licensing fees from traditional and SVOD partners (see Exhibit 2). 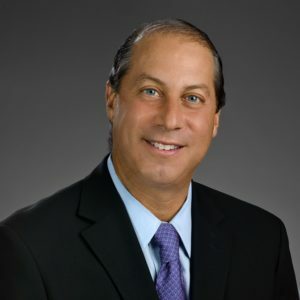 AT&T’s strategy flies in the face of the movement to closing off distribution paths that started to take form back in November 2015 when Fox and Time Warner both suggested that they realized that the checks they were cashing to make short-term quarters were starting to endanger the long-term health of the ecosystem. Ironically, perhaps recognizing the pain and cost of ending the SVOD gravy train, both Time Warner and 21st Century Fox decided to exit the TV and film production industries by selling themselves to larger, more diversified companies. What does the content landscape look like? Looking into 2019, we would expect that recent M&A activity will impact how off-network TV and Pay 1 film rights will be sold and organized in the future. 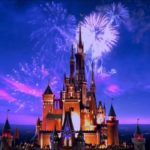 The differences in approach will mean that some companies like Disney will need to willingly forgo licensing revenue in order to develop a loss-making subscription business that will only be worthwhile if fully scaled. On the opposite side of the aisle, it does not sound like WarnerMedia will willingly sacrifice license fee revenue to build a fully-scaled SVOD platform. We call that the “having your cake and eating it too” strategy. Going forward, we would expect that only shows produced for the CW, CBS, and the occasional independent studio show that makes it onto a broadcast schedule (like Sony’s Blacklist) will wind up on Netflix. Knowing that off-network shows were becoming more difficult to procure globally, Netflix has obviously adjusted its strategy to move upstream by signing key showrunners, moving to a fully global model and sourcing its own original content. Given the changes in control at Hulu and the consolidation of Fox’s and Disney’s TV studios, we wonder if Hulu will be looking to add any more non-partner shows to its platform in the coming years. 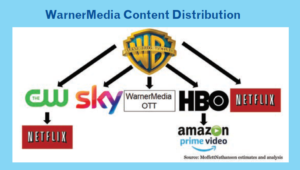 Furthermore, with AT&T’s interest in launching its own WarnerMedia-infused SVOD service in 2019, we wonder if Warner Bros. changes its content licensing strategy to shift new shows away from Hulu (where it currently owns 10 percent) and into that new service. Lastly, with Disney in control of Hulu, and having been drawn into an expensive battle with Comcast to buy both Fox and Sky, we wonder if Disney will seek to buy less NBCU content. Where does this leave us with Netflix? 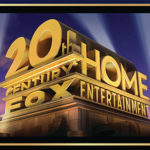 As we review the differing strategies of Disney and WarnerMedia, it is clear that Fox and Disney are taking a very different approach than WarnerMedia when it comes to licensing content to SVOD competitors. Truth be told, the WarnerMedia approach, if it doesn’t change in the coming year, continues the frenemy strategy that Netflix has exploited so well.